"The Campus is a reality. Campus. The newsletter will be published in August. history will need to be revised"
States as early as the 1820s. munal life as early as 1846.
play in our lives as Jews. charges the least for seats. why the need for more money? Union. He also performed in Leningrad and Tashkent. Petrozavodsk. The concerts were a special feature of this visit. Secretary of State George P.
room No appointment is necessary. synagogue may thrive for all. If you're not a member JOIN! Over 100 people attended the YAD Annual Meeting. who may want to get involved. Community Center of the Greater Palm Beaches. become Camp Shalom & Family Park. Shalom and Pre-School Central at 45th Street & Military Trail. Center at Temple Beth El. 5029 Okeechobee Boulevard in West Palm Beach. renovated and displays beautiful new signage. hosts the National Jewish Theatre. hundreds of people who enjoyed playing in the "snow". Center, was our most successful to date. Wide Chanukah and Israel Independence Day Celebrations. Shalom Newcomers service welcoming all n<>w Jewish residents. homebound has served over 77,000 meals this past year. year and this number is expected to double next year. and the Young Couples Club. almost 350 children this year. ... The JCC celebrated its bar mitzvah this year. which was well-attended by government officials. ... A JCC Business Advisory Committee was formed. sister-agencies worked on a variety of community needs. updating its Personnel Code and Community Mission. funds in the amount of $250,000. $175,000 grant received from the Children's Service Council. Campus Corporation for relocation of its facilities. victimized by a political blow. agency was not presently possible. go-round on the "Who is a Jew?" issue. There is no victory in this action. from the overt to the covert. there was a resolution proposed. Published Weekly October through Mid May Bi Weekly balance ot year >4.' issues! 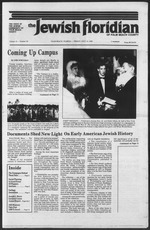 POSTMASTER: Sand address changes to Tha Jewish Floridian. t-iiii Set '>. i I i..
for the destruction of Israel. - October 1988 fire season. been burned since last month. fires are believed to be arson. refused to negogiate. In 1978.
but none would join Egypt. been moving to the territories. ments between 1984 and 1988.
to Israel's two major cities. allowed to live in Jordan. aunts and uncles and cousins. Where shopping is a pleasu re. concerns about the work in progress. the past I have faith that you will. our family support system is everything. first concrete was poured only grew as foundations and walls began to rise. budget allotment were being met in a timely and proper fashion. firmly decided the success or failure of the test samples. on providing the elderly we serve with the finest facilities possible. therapeutic and social services to the eWerfy in their own homes. nursing home residents as wed as private duty nursing to patients in area hospitals. remain at home, living as independently as possible. tion and wellness and aging. 9:45 a.m., July 3, 10, 17, 24. 5:30 at the JCC Senior Center. at Camp Shalom at 1:30. Meeting July 14 at 1:30 p.m.
petition. Call Ellie at 689-6332. August 9 and 23rd at 1:30.
chance to win lovely prizes. featuring special drink prices plus hot & cold buffet. available off the menu. Cost: $2.00 for movie. bistro for great food and cool drinks with good company. refreshments will follow. Cost: $3.00. followed by Services and Oneg. "Discovering Our Full Potential" led by Bill Rosenfeld. Cost: JCC members $2.00; non members $3.00. served. Cost: JCC members $3.00; non members $4.00. in the Airport Hilton Hotel (Southern Blvd., west of 1-95). Exodus", followed by a discussion of what we've seen. members $1.00; non members $2.00. popular spot. Cost: $1.00 plus your own fare. Thursday, July 27, 7:15 p.m. Concert at Bryant Park. For informatitm please call the JCC, 689-7700. Dinner Theatre on August 2.
ested in learning how to knit? like to form a JCC Chess Club. you in today's medical system. Early Childhood or related (laid. BA In Early Childhood or related field.
. MSW or equivalent geriatric degree. Friday, 9:00 A.M. 5:00 P.M.
23: Rabbi Daniel Landes. Repeats. GOLDEN LAKES TEMPLE: 1470 Golden Lakes Boulevard. R..ad. Lake Worth. Phone 967-3600. Rabbi Richard K. Rocklin. for this life cycle milestone. as the spiritual leader of Temple Torah of West Boynton Beach. Century Village, West Palm Beach. GELMAN. Rosetta. 62. of Jupiter. CLICK, Sam, 77, of Lake Worth. KANTOR, Mildred. 70. of Atlantis. KLEIN, Fay, 72. of West Palm Beach. Israel as a water of sprinkling ... a purification from sin"
rock; Moses was to speak to the rock, and it would gush water. Sihon, king of the Amorities, and Og, king of Bashan. & Funeral Chapel. West Palm Beach. Free Appraisals over $5,000 i*'1c*,,' ?' *"
missions to Israel last year. leaders tell the true story. nullify the covenant" (Ruz al Yussef, May 15). program which will respond to each political phase,"
ent Palestinian state" (Gulf News Agency, May 20). ft printed unth iwrmisinon from Near East Report. from Yerevan to Tel Aviv. took on a total of 40 people. plane to and from Yerevan. program had on their lives. 6,000 people to Israel in 1989. Serving Dade, Broward and Faint Beach Counties. international rates brochure 1 NO WM-4000.